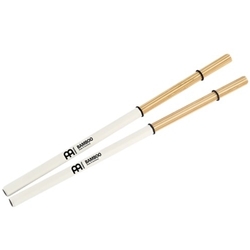 Meinl BMS1 Multi Stick Pair..
Meinl Bamboo Multi-Sticks can be used on the cajon, drum set, or any other instrument that could benefit from a 'chaffy' attack that lies somewhere between the timbre of a regular stick and a pair of brushes. The extra-long grip on these mallets give you a place to choke up, if you'd prefer more rebound. Rubber O-rings allow you to adjust how tightly the bamboo dowels touch each other - looser bundles increase the amount of attack noise the dowels themselves create.